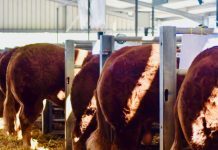 Following the cash-back Herd Health Initiative introduced by the Society in 2005, a second major health step saw the introduction of Herd Health Declarations at BLCS Collective Sales from 2007. 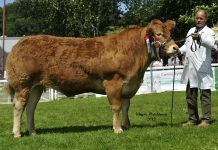 New herd health rules were introduced by the BLCS at nominated premier Collective Society Sales from May 2011 and these are now in place at all premier BLCS Collective Sales (Stirling February & October; Carlisle February, May, October & December; Brecon May & November). The principal aim is to standardise herd health declarations and information presented in order to provide both members and customers alike with clear, accurate herd health information at the point of sale and within the given sale catalogue. As such it is attractive and informative for customers and aims to further raise the level of buyer confidence. Part 1. From 1st May 2011, herds selling at the premier Collective Society Sales have to be members of, and adhering to, the terms of a CHeCS approved Herd Health Scheme. At a minimum, this must include a whole herd test for Johne’s disease. Part 2. 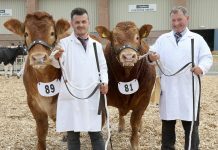 From 1st May 2011, all animals male and female, including calves at foot, presented at the premier Collective Society Sales be EITHER from a BVD Accredited Herd within a CHeCS approved Herd Health Scheme OR to have been BVD tested virus free. All animals forward will be required to be BVD vaccinated prior to sale with an approved vaccine. Pregnant animals must have had testing and vaccination completed prior to service. Vaccination of calves at foot to be in accordance with CHeCS guidelines and recommendations. The sale entry form is accompanied by a Herd Health Declaration form asking vendors questions regarding for example: TB status; membership of CHeCS (www.checs.co.uk) health schemes (Advance Cattle Health Scheme, AFBI Cattle Health Scheme, Herdsure Cattle Health Improvement Service, HiHealth Herdcare, NML Herdwise, Premium Cattle Health Scheme, Shetland Animal Health Scheme) and Johne’s, BVD, IBR and Lepto status. This form is shown here. A condensed version of the Herd Health Declaration information appears in the Vendors’ Index at the front of the respective sale catalogue. 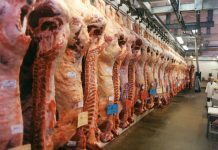 Is the Herd Health Declaration compulsory? For premier collective sales (Carlisle February, May, October & December; Stirling February & October; Brecon May & November) the Herd Health Declaration is compulsory. For reasons of clarity and to provide purchasers with the most accurate information available, vendors are required to complete this at time of entry. Although not compulsory at other collective sales (Ballymena, Dungannon, Thainstone & Stirling in May), the Society recommends that vendors complete the Herd Health Declaration. This information then appears in the Vendors’ Index within the catalogue. Where a member has chosen not to complete the Herd Health Declaration, it will simply say ‘No Herd Health Declaration’. What Other Health Information may be displayed? Vendors are encouraged to apply to their respective CHeCS health scheme for individual animal health cards for display on pens. For an individual animal’s test results, or vaccination histories, regarding BVD, IBR, Lepto or Johne’s, these are permitted above the sale pens only upon presentation of a signed veterinary declaration to verify that the animal concerned has had a clear test. Again, for reasons of practicality, no health information notes are to be put in the catalogue footnotes by vendors. Similarly, the Society has requested that no declarations on health information be given by the auctioneer during the sale. Again, the sole purpose of this is to avoid confusion and to try and ensure that the information provided is done accurately, fairly and in a standardised format in the catalogue. This point has been agreed with the auctioneers. 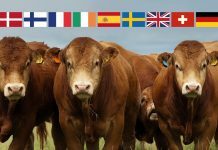 From 1st January 2013, CHeCS, the self-regulatory body for cattle health schemes in the UK and Ireland, has agreed a change to Johne’s testing with herds classified on a Risk Level basis of 1 to 5 (with 1 being low risk and 5 high risk). Please note that the new Risk Levels only apply to herds that have completed a whole herd test for Johne’s under the new classification (which could be any time until 31st December 2013). In due course, a new version of the Herd Health Declaration will include a section where breeders will be able to indicate their Johne’s Risk Level, once known. Should you have any queries regarding the new Johne’s Risk Level classification, please contact your respective CHeCS health scheme. What if a vendor is selling an animal/s that he did not breed? Vendors are still requested to fill in the Herd Health Sale Declaration accordingly. Prospective customers are advised to speak to vendors directly to acquire accurate health information on animals offered but not bred by the seller. The Society welcomes members’ and customers’ feedback on the Herd Health Declarations and health policy at sales. If you have further questions, please speak to the Society representatives, Iain Kerr & Alison Glasgow, or the Auctioneers.